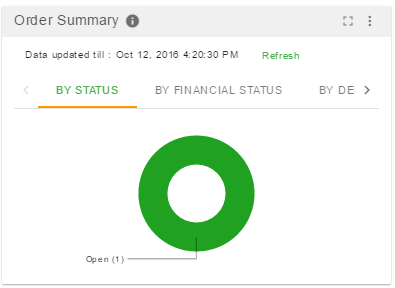 Your ShoreHippo Dashboard is the starting point for the work you do in StoreHippo. It's a landing page where you can check statistics about your store's products and orders, your store’s recent orders, and other necessary information as well. All the information is contained in widgets. You can close or collapse a widget which you don't need on landing page. You can always add widgets by clicking on the plus icon in the top right corner of the dashboard. This shows a checklist of commonly used tasks that are performed by store owners to make their store live. The To Do items are also the links that take you to the section corresponding to the task. This list is neither mandatory nor comprehensive for all the stores. Depending on your requirements, you might not need to perform certain tasks or might need to perform some additional tasks. 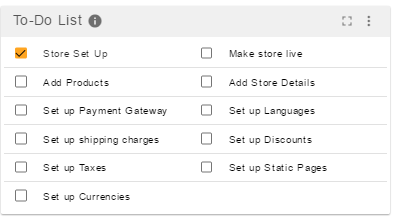 This widget shows the quick count of commonly used entities (Products, Orders, Users, Sellers) on your store. Here you can view the orders segmented by different parameters e.g. by device, by delivery status, etc. You can use Sales widget to see how your store is performing. 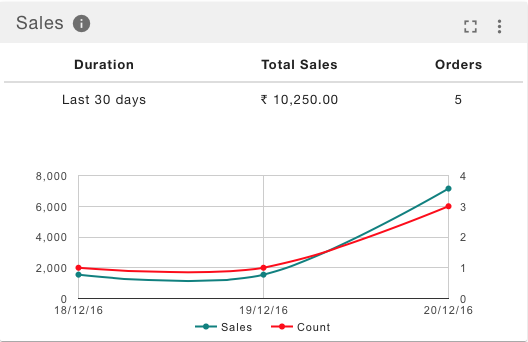 Sales widget shows the total sales/orders during a given time period. The top products widget is to view the top selling products with their description including the product name, no. of orders, items purchased and total revenue generated. Top customers widget shows the top customer's name and email id and the total price of the items purchased.